Today I think I'm just going to bring you up to date on a couple of projects I 've been working on . The first is the lampshade at right. I'd promised I show it to you once I'd finished the stitching on the shade. SO here it is! Hope you like it! The second project is this altered book wire photo holder. A large description but I can't really think what else to call it. I got the idea to use a book as a photo holder a while back but couldn't really figure out the how and why's of it. I love books and didn't want to alter them too much. I like the look and feel of books as is. So I wanted to use the book in it's form and not just pull the cover off or rip out the pages. Here's the first attempt. 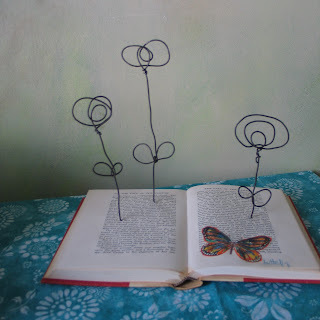 I opened the book and drilled through it so that I would be able to insert some wire flowers. I sold one of these flowers lately and before I shipped it out a made a few more to have on hand for future use. While I was playing with the form I realized that the blooms would actually work as photo holders. They're more decorative then the one's you usually see but they had the same basic twisted and looped form going for them. So they work. The look of the first one was pretty austere but I kind of like the way the organic blooms are coming from the text. BUT there wasn't much color. In my mind I was thinking the color in the piece would come from the photos displayed on it. But it still didn't seem arty enough. Then my oh so brilliant friend took a look and suggested I cut out the butterfly and somehow make it flying up from the piece. Then I added some more stamped images and the flying butterfly. I like the look of it now. Has that altered book feel going for it. And the butterflies made from text are just kind of cool. I actually stitched the paper to the wire form. Something I hadn't done for a while. It has a different look than fabric. Very crisp.